We use angle-resolved photoemission spectroscopy to show that the near-surface electronic structure of a bulk insulating iridate Sr3Ir2O7 lying near a metal-Mott insulator transition exhibits weak metallicity signified by finite electronic spectral weight at the Fermi level. The surface electrons exhibit a spin structure resulting from an interplay of spin-orbit, Coulomb interaction and surface quantum magnetism. 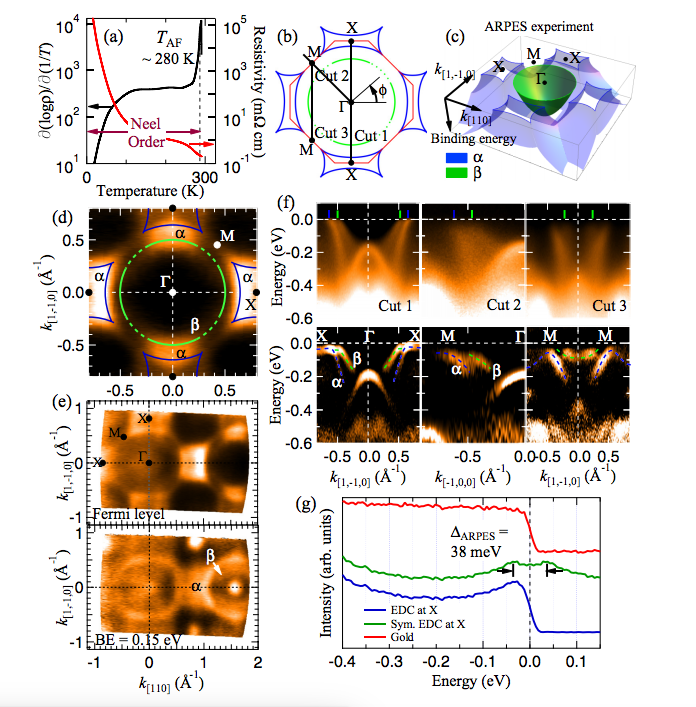 Our results shed light on understanding the exotic quantum entanglement and transport phenomena in iridate-based oxide devices. Spin-correlated electronic state on the surface of a spin-orbit Mott system. Published in C. Liu, S.-Y. Xu, N. Alidoust, et al., Phys. Rev. B 90, 045127 (2014).